For those of you unaware, FAAN has walks across the country to raise money for research and education involving food allergies. This is Allergic Traveler’s second year participating. We do walks across the country. This past weekend, we were at the Raleigh Walk. We have had the privilege of meeting some great people along with seeing some familiar faces. The best part about what we do is the appreciation we get from parents. 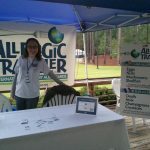 The business model behind Allergic Traveler came out of necessity and my love of travel. My parents taught me the wonders of travel from a very early age. I went to Florida before my second birthday and have not stopped traveling since. Now I understand that my parents are unusual. Not all parents with allergic children are comfortable getting on a plane and leaving the country. Now imagine if you add a foreign language to the equation, it makes it even scarier but it is doable! I met many parents that thanked me for giving their children a sense of empowerment and freedom even if it was just locally. As parents are scared to travel, many of our customers use our cards at local restaurants. Our cards are particularly helpful when they are not sure who is in the kitchen preparing their child’s meal. If you are in an ethnic restaurant, there is a good chance the staff’s first language may not be English. So it makes sense to have a card that lists your child’s allergens in their native tongue. Of course we also make our cards available in just English for non-ethnic restaurants. My favorite moment of the walk was when one mother asked if she could hug me. Her two little girls were standing beside her, each with their own allergies. They asked to hear my story and thanked me for being such a great role model. If I can help make a difference, even a small one, then it is all worth it. My least favorite moment, was when one of the parents was on the podium speaking about their allergic child. They said “I still remember when my child fell unconscious in their high chair from eating strawberries.” It broke my heart. Finding what causes allergies or a cure is a continuous battle for both the parents and the children. The good news is that there are lots of organizations recognizing the importance of awareness in our field. Together, with the support of so many, we can live normal lives. Thank you Raleigh for welcoming us to participate. We are looking forward to our next walk, which will be in Long Island. If you are in the area, please come say hello and share your story!